Whatever plane, train, car, or bike gets your man where he’s going, this bag will be his new daily companion. 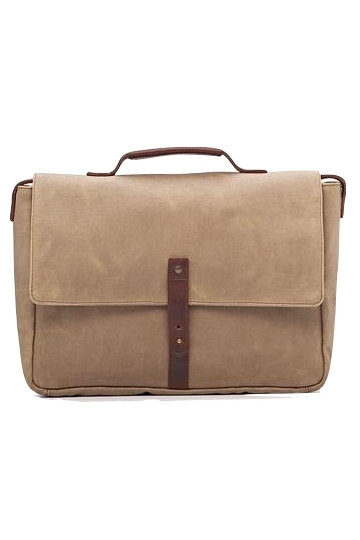 Classic enough for the office, but durable enough to get thrown around, the Loreto messenger bag is the perfect gift for any guy looking to keep his life in order. Equipped with a padded slot for his laptop, plus compartments for his phone, note pads, water bottle, and pens, he needs this even if he doesn't know it yet. The main compartment holds plenty of space for books, files, or the stacks of love letters he’ll be hand writing to you. Don’t call this a “sweatshirt”—it’s so much more than that. Comfortable without being sloppy, slim but not too tight, this classic wardrobe staple covers all the bases for everyone from your brother to your boyfriend. Just make sure you buy a color you love, because you'll be seeing it a lot--and for a long time. Flint & Tinder designed their 10-year hoodie to last a decade. And you know what the guy you give this to will be doing every time he zips this thing up over the next 10 years? Thinking about you, the greatest gift giver of all time. Made in the U.S.A. “from seed to stitch”, the 10-year hoodie is sewn from cotton grown in the Mississippi Delta, includes zippers machined in Georgia, and passes through the hands of 20+ American workers on its journey to your doorstep. Flint & Tinder's mission is to re-ignite American manufacturing by partnering with incredible garment makers around the U.S. to produce thoughtfully crafted clothes that are built to last. If the men in your life think there aren't enough ethical options for them on the market, here's a good place to start. The guy in your life is either a watch guy or he isn't. If he is, this unique design from Original Grain will be a stellar edition to his existing collection, and guaranteed to be a conversation piece wherever he goes. And during that conversation, he can share that this gorgeous timepiece is made from reclaimed German Oak beer barrel wood, and stainless steel . What is more manly chic than that? Oh, and if your guy isn't a watch guy, buy him this anyway. It'll make him one. Original Grain was started in 2013 when brothers Ryan and Andrew Beltran were inspired to create a watch that simply didn’t exist. Influenced by their roots growing up in the Pacific Northwest, the mission was to create unique timepieces that seamlessly integrate natural hardwood and stainless steel. Today, Original Grain is not only known for the craftsmanship that goes into each design, but the stories that can be told about the materials used. The company works with Trees for the Future Non-Profit Organization, who plants 1 tree for each watch sold, providing both food and jobs for thousands of people around the globe. Outerknown's founder is the famed world-class surfer Kelly Slater, who started the company, in his words, "to lift the lid on the traditional supply chain and prove that you can actually produce great looking menswear in a sustainable way." The company is fully transparent (you can read their full list of suppliers on their website) and committed to making products that are focused on the well-being of both the people who make them and the environment . Ironically, they had never planned to do denim. As an environmentally conscious company, it just didn't seem possible given the human and environmental consequencecs of denim (2 billion pairs of jeans are produced every year, each requiring almost 2,000 gallons of water to produce, and denim chemicals are dyeing rivers around the world an alarming shade of blue). Long story short, they realized that Levis was working on a more eco-conscious denim line based on waterless dyes and cotton designed for max recyclability, and when they put their minds together these amazing jeans were born. Be forwarned: if you buy someone you live with this Travel Kit from Sword & Plough, expect to see it living on your bathroom countertop for the foreseeable future. It's so man-styly (not a word? It is now!) that your man won't want to put it away. And that's fine, because it'll hold all his toiletries and with one tug of the zipper, make them all disappear. If the guy in your life is a travelin' man, even better; now he can ditch the Ziploc bags he's been stuffing his razor and toothbrush into for good. This made in the U.S. kit is durable and water resistant, but also looks really cool. Sword & Plough is a socially conscious brand that works with American manufacturers who employ veterans. The company recycles military surplus (this bag is handmade in the U.S. using military grade fabric, and high quality American leather) and incorporates that fabric into stylish bag designs. Plus they donate 10% of their profits back to veteran organizations. Support our troops, repurpose textile waste, get your guy (or yourself!) a great toiletry bag? There's no downside here.